It is with great sadness that we write this today; the Sparrow & Crowe graphic novel, recently solicited through Diamond and Amazon.com, has been cancelled. Hermes Press, our publisher, has been very supportive of the book, but we knew the risks when we solicited the book for pre-sales — if the orders were too low, Hermes Press would not be able to print the book. So, what does this mean? Well, all five chapters of the book are still available on ComiXology.com, so if you read digital comics on your computer or tablet, this is still a viable option. That said, we’re still looking at options to bring the printed book to you. We’re proud of the book, and we’ve gotten very positive reactions from those who have read it. But pre-order sales are a tricky thing, and we’ve got to look at new strategies for the book. Thanks again for your support. We’re grateful for every single pre-order that we did get. And, as always, you can contact us at mailbag (at) sparrowandcrowe.com if you’d like to reach us. We’re not done yet. Stay tuned, and we’ll keep you posted. 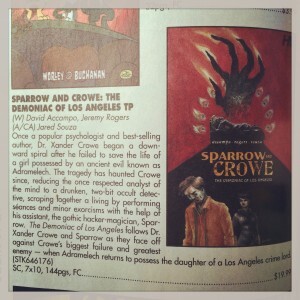 Sparrow & Crowe in the Diamond PREVIEWS catalog. Here’s the deal, folks. Right now, as we speak, amazing comic book stores all over the world are using something called the Diamond PREVIEWS catalog to decide what books they will stock on their shelves this AUGUST. One of the choices is the Sparrow & Crowe graphic novel. The book has been solicited, but this is NO guarantee that we can afford to print the book. Our publication is dependent upon the orders that comic book stores (and bookstores and Amazon) place. What does this mean for you? Well, in modern terms it’s a little like a Kickstarter campaign. To ensure you receive your printed copy of the book, you need to make a promise to your retailer — that you’ll buy the book when it arrives in shops in August. All you need to do is ask your retailer. If they can’t find it, let them know it’s listed under “Hermes Press” in the comics section of the catalog. Now, you know we’d never ask you to buy a book sight unseen. To offset our request that you order early, we’ve made the entire first chapter (the first issue of the original comics series) available for FREE! You can get it right from our site here (as a DRM-FREE PDF) — or you can download it from ComiXology. Read the first issue and check out the set-up. If you like what you read, please consider asking your local comic book store or bookstore to order you a copy. We’re pleased to present a simple graphic that explains, as we best we can, how you can read the complete, print edition of Sparrow & Crowe: The Demoniac of Los Angeles. Sparrow & Crowe — Complete series available digitally. Issue #1 is FREE! Not a misleading headline. At long last, the entire digital series of Sparrow & Crowe is available on ComiXology. So, if you love to read comics on your computer or tablet, you can now read “The Demoniac of Los Angeles” in its entirety — as well as the Halloween anthology book. But we’ve got even better news. In order to give you all a taste of what’s to come — we’ve made the first issue FREE. Not only is it free on ComiXology, we’ve also turned it into a DRM-Free PDF — available on this very site — in case you prefer your comics that way. Download the PDF (right-click as ‘Save As’). Tell all your friends about it. We’ve done this because we want to get everyone excited for the PRINT graphic novel, soon to be available for pre-order. We will need orders up front, whether they come from Amazon or your local comics retailer, but without you as our ambassadors and champions, retailers MAY not order enough copies, and the book may not go to print. We’ve lapsed a bit in our updates. If you’re happening to check in on our site, you’ll be pleased to see that, as promised, Issues 3-4 of Sparrow & Crowe are now available on ComiXology.com as digital exclusives. Our pre-orders for our print run were not strong enough to continue to publish the series as individual issues—our compromise with Hermes Press was to release issues 3-5 in digital-only formats for our die-hard fans, and then focus on a printed GRAPHIC NOVEL for the collection. Our goal is to have the collection out in the summer of 2014. We’re actually wrapping up the art and lettering on the final issue as we type this — with a late April or early May release date on ComiXology.com. So, stay tuned! We’ll post a lot more as we get get closer to the finale and the collected edition! WEIRD WINTER STORIES with Sparrow & Crowe! 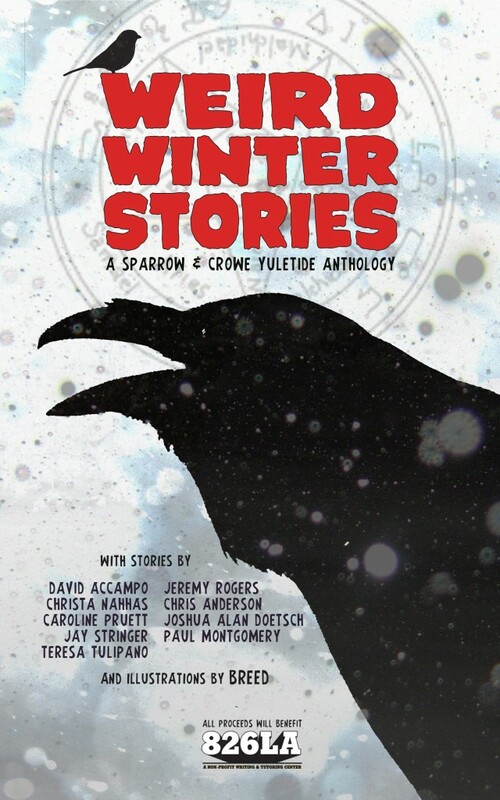 WEIRD WINTER STORIES is a Kindle-ready e-book with Sparrow & Crowe prose stories by a talented line-up of writers, fronted by series creators David Accampo and Jeremy Rogers, and including: Jay Stringer (Old Gold), Joshua Alan Doetsch (Strangeness in the Proportions), Paul Montgomery (Marvel.com, Wormwood: A Serialized Mystery), Christa Nahhas (Sparrow & Crowe Halloween Special), Caroline Pruett (FantasticFanGirls,org, Chicks Dig Comics), Teresa Tulipano (Lines+Stars, Two Hawks Quarterly), and Chris Anderson (Sparrow & Crowe Halloween Special) — with interior illustrations provided by BREED (Sparrow & Crowe Halloween Special). The e-book is currently available in the Amazon marketplace, and this is our favorite part: in the true spirit of the holiday, all of the writers and Habit Forming Films, LLC., have decided to donate ALL of the proceeds from this eBook directly to charity! We’ve selected 826LA as our charity this year. 826LA is a wonderful non-profit organization dedicated to supporting students ages 6 to 18 with their creative and expository writing skills, and to helping teachers inspire their students to write. 826LA provides after-school tutoring, evening and weekend workshops, in-school tutoring,help for English language learners, and assistance with student publications—and all of these services remain free because of donations. At Habit Forming Films, LLC., we have always championed the power of story to entertain, to communicate, to explore, and to reveal Truth. We are very excited to help the next generation do the same, and YOUR purchase of our e-book will help enable us to do that. For more information about 826LA, visit their website at http://826la.org. 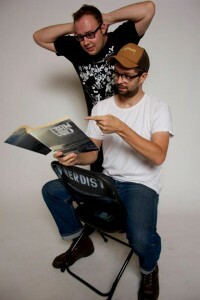 Dave Accampo & Jeremy Rogers at the Long Beach Comic & Horror Con! 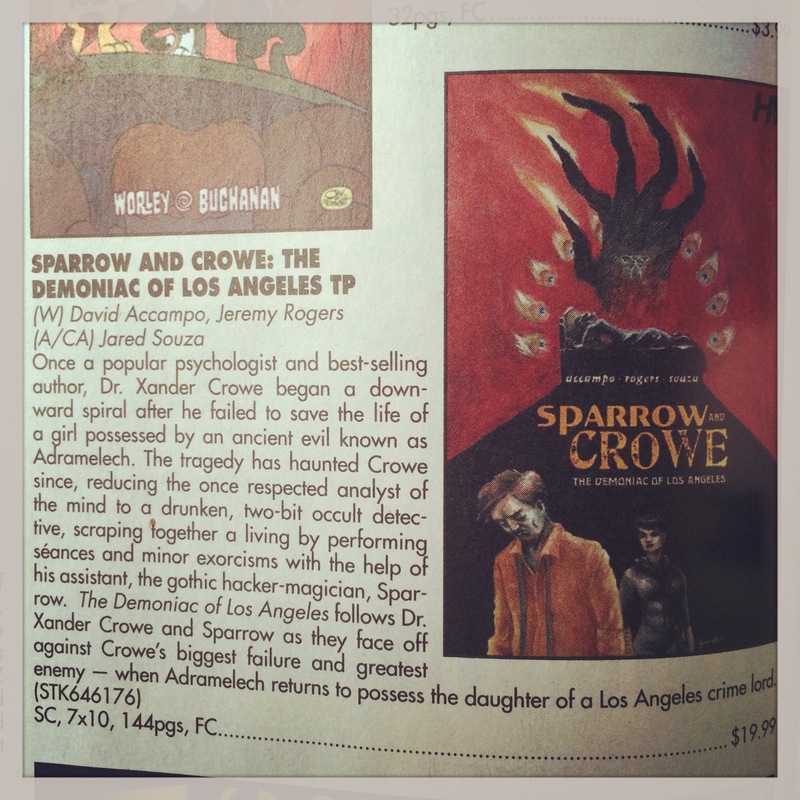 On November 3-4, come visit SPARROW & CROWE writers David Accampo and Jeremy Rogers at the Long Beach Horror and Comic Con in Long Beach, California! Dave and Jeremy will be at Booth #1502 in the Artist Alley section of the show floor (for a map of the show floor, click HERE). They’ll be signing copies of Sparrow & Crowe #1-2, as well as a VERY unique and special con-exclusive book, printed just for the show! Come by to see what it is! Posters and preview art will also be available. Christa Nahhas, Chloe Myaskovsky and Chris Anderson, contributors for the SPARROW & CROWE HALLOWEEN SPECIAL will also be dropping by at various times! On Sunday at 1pm, Dave and Jeremy will also guest on a special “Comics from Scratch” Q&A panel — all about creating comics, utilizing Kickstarter, publishers, digital publishing and more! The panel begins at 1pm on Sunday in Room 102B! Horror and Horror Comics on Fuzzy Typewriter! 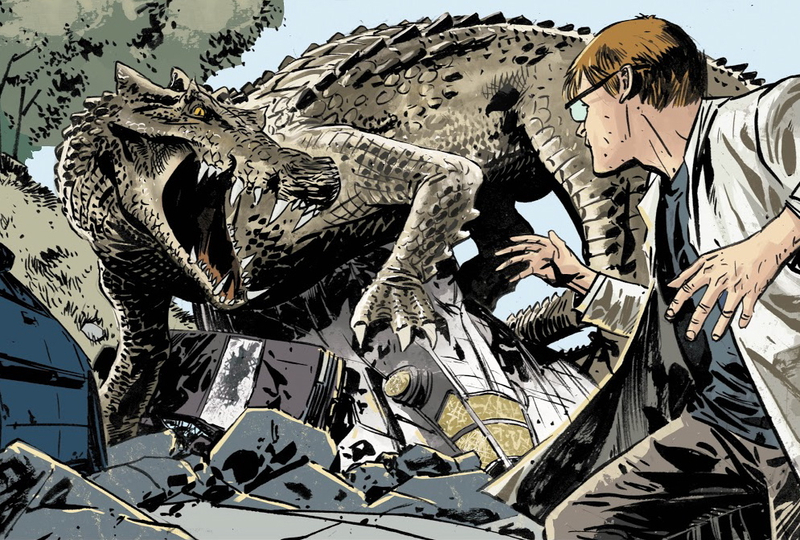 Just in time for Hallow’s Eve, Dave Accampo and Jeremy Rogers sat down with Gabriel Hardman and Corinna Bechko for a roundtable discussion on our favorite types of horror, horror comics, and the process of writing. 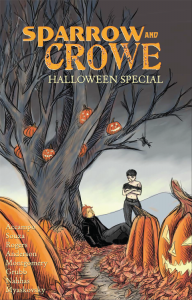 It’s a fun, in-depth discussion that reveals some behind-the-scenes processes bits about SPARROW & CROWE: THE DEMONIAC OF LOS ANGELES and the SPARROW & CROWE HALLOWEEN SPECIAL, as well as Gabriel and Corinna’s books HEATHENTOWN, STATION TO STATION, and PLANET OF THE APES: CATACLYSM! Check out the show HERE, or subscribe via iTunes. Dave and Jeremy on Meltcast 2.0! Dave Accampo and Jeremy Rogers were invited to sit down with Jake and Ryan of Meltdown Comics‘ Meltcast 2.0! The guys share the origins of the Sparrow & Crowe comic book, as well as how they write together, and then they launch into a roundtable discussion of the week’s comics — including Hawkeye #3, Before Watchmen: Minutemen #4 and many more! For the full podcast, click here! We already knew it was a charming cover by Jared Souza, but apparently we aren’t alone! 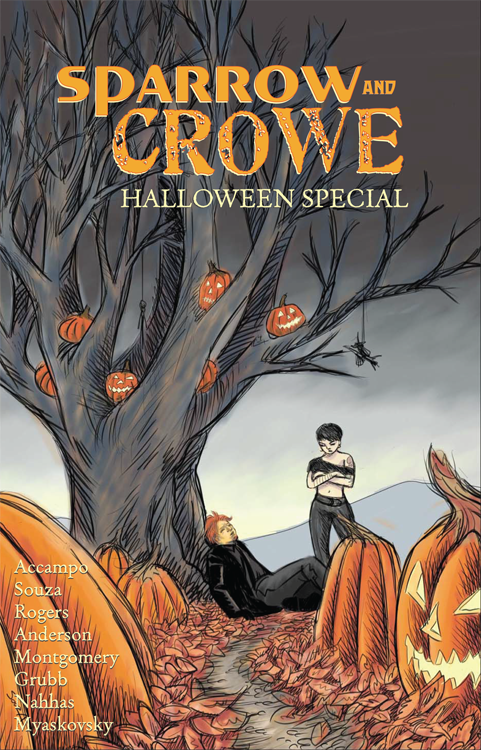 The Sparrow & Crowe Halloween Special has made the “Best of the Week in Covers” feature on iFanboy.com! Click the link to see Paul Montgomery’s write-up (and his full disclosure: he has a story in this volume).